Here is the thing, some celebrities build their reputations on being “the every day guy” or “average joe” when they are not. Jay has earned $350 dollars from TV shows and is by far not a regular person. He puts himself in a position by wearing denim clothes, and talks like an every day guy, but buys million dollar homes and cars. He is not frugal by any means but part of his appeal is if I as a regular joe got his kind of money, I’d be just like him. I mean other celebrities go the other end, like Paris Hilton spending money, etc. The sad thing is many people don’t have the critical thinking skills to determine that these people are not what they seem and just read the headline and assume it is fact. This is the reason we have measles outbreaks in the US at the moment. It is just hard to use your brain. I don’t begrudge him for spending money that way either. 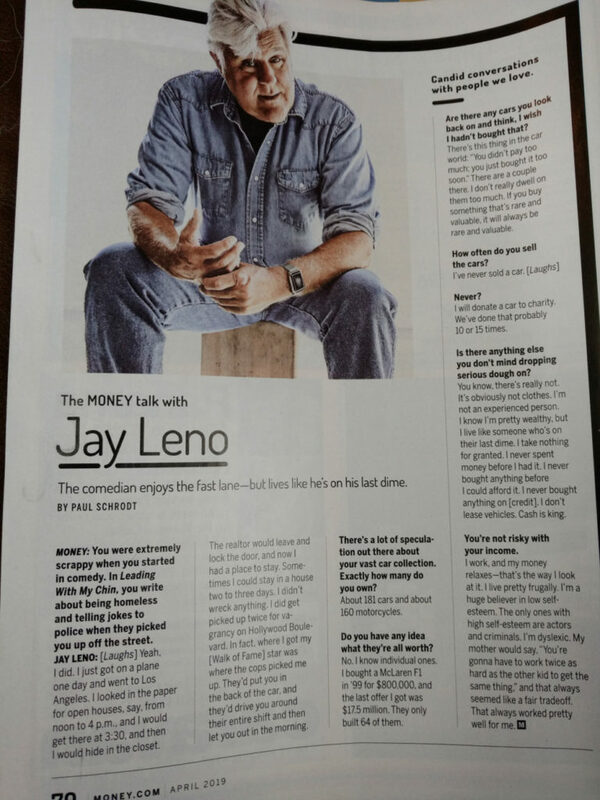 However, I think he should have the self-awareness to say, “Maybe I can’t play the ‘average joe’ frugal role in Money Magazine while talking about my extensive spending on cars.” Maybe he could have went with another angle or maybe ax the interview all together. I am not saying I begrudge him, just like you said – more self awareness. Either that or the editors of Money making that editorial decision for him. Hey you only live once so spend it while you can enjoy it. I think people(me too) tend to lose perspective based on who they are around and what they see regularly. In Jay’s circles he may be frugal, but his scope is so limited. Why are people so hateful about politics, religion, etc? They don’t have a relationship with people with differing views. I know it’s a popular growth teaching that your friends should be those that challenge you and make you grow, basically “friend up”. I get it, but I think it’s good to have a close friend that works hard but can’t afford health insurance, maybe skips a meal to buy the kids new shoes. Puts life in perspective. Even if he hangs out with celebrities, I don’t think he can really be seen as frugal though, right? And as a comedian, I’d think he’d have to keep the pulse on the “average joe” as Big-D tells it. I agree with having friends like that. In fact, I’m starting to seriously worry that my kids have it too good and aren’t getting that perspective. Our kids had it good, not sure how to adjust that. We did private school, but neither kid took advantage of that so the ROI was terrible. If I had it to do over I’d put them in the local(very good) public school. Heh, that’s a pretty skewed definition of frugal. Jay Leno should spend more. He has a lot of money and shouldn’t hoard it. His home is just a tiny fraction of his net worth, that’s a lot better than more people. It doesn’t read well to the average Joe, for sure. As one would expect, me and Leno shop at very different stores. Take the dollar figures out of it: I remember when one of those books about Leno and Letterman came out, it mentioned that Leno banked the entirely of his Late Show paycheck, spending mainly money he earned from doing standup. Banking your paycheck and living on what you earn from a side gig? Sounds frugal to me. One other thing worth mentioning is that Leno mentioned that he was given clothes at the Late Show, so he didn’t have to buy them. I bet they also provided food during the day filming. It’s possible that working conditions eliminated some of the things that typical people pay for. Not to go full snowflake with it, but if we stick to dollar figures as the final arbiter of the term, it’s going to be tough for anyone even buying a computer to post here to make a claim to frugality. last I checked the worldwide median income was around 10k…. To me frugality is about being thrifty within your means, not keeping your spending to a number that any third party will subjectively feel is appropriate. 13 million for a house is a big number. It’s also less than half of one percent of Leno’s net worth from what I could see online. I wasn’t saying that dollar figures have to be the final arbiter, but I think they should play a central role. However, even a computer purchase (at least of some kind) could usually fit into a frugal definition. For example, it could allow you to cut the cable or research ways to save money buying a car. And while the $13 million house may be less than half of one percent of Leno’s net worth, it might not be his primary residence. Most stars wouldn’t choose to live in Rhode Island in the winter… especially if they also have a Beverly Hills home – https://carproperty.com/jay-leno-s-beverly-hills-house-and-garage-ad50061496.htm. The house only has a 6-car garage, so he has to store his 180 cars elsewhere. In short, there’s a lot more spending beyond even these large numbers.